Members of the Rho Omega Chapter of Sigma Theta Tau International Honor Society of Nursing gather with several members of the Sigma Theta Tau Board of Directors. Pictured left to right: Sigma Theta Tau International (STTI) Director Tim Porter O’Grady, Stephanie Powelson, Brinda Geisbuhler, Stephen Hadwiger, STTI CEO Nancy Dickenson-Hazard, STTI President Dan Pesut, Mariquit “Kit” Hadwiger, Martha Smith, Rebecca McClanahan and Sharon McGahan. 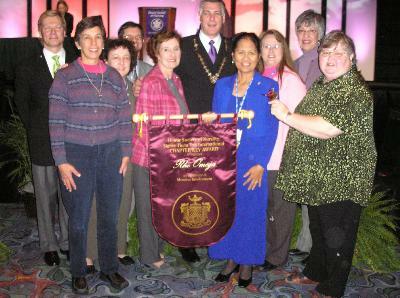 Rho Omega Chapter of Sigma Theta Tau International Honor Society of Nursing received the Chapter Key Award from Sigma Theta Tau International during the 38th Biennial Convention on Nov. 15, in Indianapolis, Ind. The Chapter Key Award was established by Sigma Theta Tau in 1991 to honor chapters who excel in membership recruitment and retention, publicity and programming, and professional and leadership development. Application for the Chapter Key Award requires rigorous planning and monitoring of chapter activities during a two-year period for each award cycle. Rho Omega chapter received its charter into Sigma Theta Tau International two years ago at the 37th Biennial Convention in Toronto, Canada. To receive the Chapter Key Award during the first two years of chapter status was a special honor. When notification of the award was received on Sept. 15, one comment from the judges stated, “This entry is so professionally well-done that it can serve as a model for other young chapters.” Members of Rho Omega were supported in their efforts to achieve the Chapter Key Award by members of Pi Pi Chapter in Blessing-Rieman School of Nursing, Quincy, Ill.
Rho Omega contributed to the 38th Biennial Convention in other ways in addition to receiving the Chapter Key Award. Stephanie Powelson, associate professor of nursing; Mariquit “Kit” Hadwiger, assistant professor of nursing; and Stephen Hadwiger, associate professor of nursing, moderated international research sessions. The 38th Biennial Convention was attended by 1,993 people from 27 different countries and 387 chapters. Sigma Theta Tau International represents more than 360,000 nurses from more than 90 countries. Its mission is to provide leadership and scholarship in practice, education and research to enhance the health of all people. A small contingent of the Truman Forensic Union visited the University of the Pacific in Stockton, Calif., Nov. 11-13 to attend the Pat Kennedy Memorial Round Robin and the Paul Winters Invitational, both of which saw notable Truman victories. The Pat Kennedy Memorial Round Robin, held Nov. 11, is an invitation-only tournament to which 12 of the nation’s most prominent debate teams receive bids. Truman’s team of Meghana Kunkala, a senior biology major from Chino, Calif., and Dylan Rothermel, a sophomore economics major from Homewood, Ill., reached the semifinals of the Round Robin (third place), making the pair’s second appearance at the semifinal level in Round Robins. The first being at William Jewell College in October. This is the third Round Robin Truman has received a bid to this season—the most ever in a season for the squad. The Kunkala and Rothermel pair continued their successes at the Paul Winters Invitational, also hosted by Pacific, Nov. 12-13, reaching the quarterfinals (or top eight) of a 65 team field. Additionally, Kunkala placed third in both extemporaneous speaking and rhetorical criticism. This overall performance, as well as performances posted by Rothermel and teammate Trevor Alexander, a senior economics and English double major from Gladstone, Mo., put Truman in second place in “small school sweepstakes,” an award honoring teams with the best combined debate and individual events entries that had relatively small entries. This concludes the fall schedule for the team, which will resume competition in January with invitational tournaments at Northwest Missouri State and the University of Utah. During the weekend of Oct. 28-30, Scott Chenault, instructor of justice systems, accompanied 19 Truman students of the Lambda Alpha Epsilon, Tau Chapter, to the American Criminal Justice Association (ACJA-LAE) Region Three conference in Springfield, Mo. As part of the conference, the students and faculty member participated in a series of competitions designed to test their abilities in various fields of criminal justice. The competitions are divided into four areas: academic testing, physical agility, crime scene investigation, and firearms. Kristin Jacobs, a freshman justice systems major from Kirksville, won third place in the 25 and under female physical agility competition. The team of Lindsay Lambert, a junior justice systems major from Maryland Heights, Mo. ; Beatrice Kelrick, a junior justice systems major from Kirksville; and Lauren Block, a junior justice systems major from Florissant, Mo. ; won third place in the lower division (less than 70 hours of college credit) crime scene competition. Kristi Schneider, a senior justice systems major from Rolla, Mo. ; Taryn Spoon, a junior justice systems major from Beardstown, Ill.; and Kenny Jacobs, a senior justice systems major from Kirksville; won third place in the upper division crime scene competition (more than 70 hours of college credit). Kelrick also won first place in the lower division corrections written-test competition. Schneider garnered third place on the upper division corrections written-test. Lindsey Harris, a senior justice systems major from St. Louis, won first place in the upper division juvenile justice written-test competition. Brianna Wagner, a freshman justice systems major from Ballwin, Mo., won third place in the lower division police management written-test competition, while Nick Zotos, a freshman justice systems major from Chesterfield, Mo., won first place in the same category. In the upper division police management written-test competition, Spoon finished in third place, while Schneider won first place. Finally, Chenault took second place in the police management written-test competition in the professional division. The Clay Dawson Choral Scholarship has reached the $10,000 minimum amount required to endow a scholarship at Truman. The scholarship fund was created as a tribute to Clay Dawson. He served as the director of choral activities and as chairman of the voice faculty from 1965 until 1991, when he retired. The scholarship will be awarded to a member of Cantoria who has demonstrated strong leadership in the ensemble and shown dedication to the choir through a positive attitude, rehearsal discipline and service. Dawson, who is now retired, worked for the University from 1965-1991. While at Truman, he organized and administered the first Missouri All-State Collegiate Choir. He also was co-chairman of Missouri’s first American Choral Directors Association convention. Special thanks to the scholarship appeal committee members: Dean Carroll (‘81), Roger Cody, Arthur Freeland (‘78), John “Vic” Grice (‘72)(‘73), Mark Jennings, Dave Kerr (‘85), Miriam (Haag) Koehne (‘86), Dan O’Donnell (‘76)(‘85)(‘87), Edwin Phelps (‘68)(‘70), Scott Piper (‘93), Jody (Kessel) Pontious (‘88)(‘92), Robert Pontious (‘89)(‘92) and W. Allin Sorenson (‘83)(‘85). For more information or to make a gift to this honorary scholarship, contact Jamie Hansen at 785.4124. For more information about establishing a scholarship, visit the Web site at http://www.truman.edu/pages/245.asp. 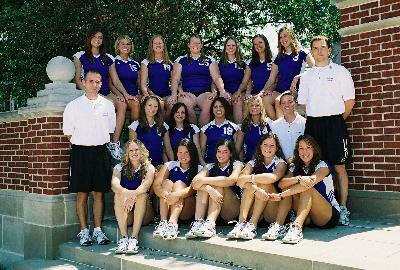 The Truman 2005 volleyball team. The Truman volleyball team made its fourth trip in the last five years to the NCAA Division II Elite Eight. The fourth-ranked Bulldogs lost in the NCAA Quarterfinals to first-ranked Nebraska-Kearney by scores of 30-25, 30-28, 30-32, 30-27. Truman was led offensively by Melissa Keck who had a team-high 13 kills and hit .294. Kelsey Wackerman and Sarah Shearman added 12 kills and Megan Remley had 11. Wackerman paced the squad with 35 assists and Christine Wagener added 26. Defensively, two Bulldogs recorded 30 or more digs. No Bulldog player has had 30 or more since the 1995 campaign. Whitney Boehler led the way with 32 and Sarah Shearman added 30. Micaela Walter, Eli Medina and Christine Wagener were in double-figures as well. Shearman was named to the Elite Eight all-tournament team for the second straight season at the conclusion of the tournament. Truman ended its season with a record of 32-6. The team won both the MIAA Tournament championship and the South Central Championship during the year under first-year head coach Jason Skoch. George Mehaffy, vice president for academic leadership and change at the American Association of State Colleges and Universities (AASCU), will address students as the commencement speaker for the December graduation ceremony. Commencement is at 1:30 p.m., Dec. 17, in Pershing Arena. Mehaffy’s division is responsible for a number of special programs and projects for AASCU presidents and chief academic officers in the areas of leadership and organizational change in higher education, focusing on issues such as technology, teacher education and international education. He organizes and directs two national conferences annually for AASCU chief academic officers and manages a variety of leadership programs and special projects. Much of Mehaffy’s current work focuses on civic engagement in higher education. In 2003 he initiated a new civic engagement project, the American Democracy Project (ADP), in partnership with The New York Times, involving 205 institutions representing 1.8 million students. That project has generated a broad range of national and campus-based activities. Prior to coming to AASCU, Mehaffy served as the vice president for academic affairs at Eastern New Mexico University. There he initiated a university-wide focus on the use of technology in teaching and greatly expanded the distance education program. For that work, in l997 Eastern was awarded the $250,000 Pew Leadership Award for the Renewal of Undergraduate Education, one of only three awarded that year. Before coming to Eastern, Mehaffy served as the director of the School of Teacher Education at San Diego State University, where his work in the design and construction of a professional development school built as a partnership of San Diego State University, the Chula Vista School District, and Cox Cable resulted in national recognition. In addition to his work in higher education, he served for 33 years in the United States Coast Guard Reserve, retiring as a captain in 2000. He was the recipient in 1994 of the Vice President’s Award for Reinventing Government. The award recognized his work in creating an innovative program in San Diego to combine active duty and reserve units, resulting in significantly greater effectiveness and efficiency. That program was subsequently used by the U.S. Coast Guard throughout the United States. If you cannot make it to lunch, stop by and pick your Truman Alumni T-shirt in McClain Hall 100. For more information contact Denise Smith, manager of alumni relations, at dlsmith@truman.edu or 785.4174. The staff of the Student Union is excited that the renovation will begin in the upcoming spring semester. The renovation is slated to begin sometime around March 10. This will be a dynamic and challenging time. The first phase will be the most difficult with the loss of the Down Under, the Georgian Room, meeting rooms 307, 308, 309 and the Governors Room. However, there are plans in place to accommodate the events that would normally require these spaces. For example, they will convert the Quiet Lounge into a functioning banquet room with a capacity between 350-400 individuals. During the renovation, they ask for your patience and assistance in planning your events. The current practice on campus is to reserve a specific space. They need your help to change the focus and center upon your specific event needs. Rather than requesting the Georgian Room, event requests should read that the user needs a space for 100 individuals with catering service and media support. By communicating the event needs, they can best accommodate all of their users by placing events as efficiently as possible. This technique will also allow them to maximize their ability to meet campus needs. Also, please consider contacting their office when planning your events. They will do their best to help anticipate concerns and find the appropriate space for your event. Please note that they may also find times that they will need to shuffle reservations to accommodate as many events as possible, but with your help, they will do their best to minimize these occurrences. Call 785.4186 for more information. Students may also pick up a Rental Housing Guide from the Student Senate Office, lower level of the Student Union Building. Tickets are sold out for this performance. The Academic Competition Organization competed in a college bowl tournament at Washington University in St. Louis on Nov. 19. The team, consisting of Kyle Hill, a junior history major from Kansas City, Mo. ; Laura Kopff, a senior chemistry and philosophy and religion double major from Affton, Mo. ; and Paul Strauss, a junior history major from Bellflower, Mo. ; took second place out of 16 competing teams. Four members of the Epsilon Eta Chapter of Kappa Alpha Psi fraternity took third place honors in “TAASU’s All Call African American Student Union Greek Step Show” on Nov. 12 in Kansas City. Avril Frick, a senior music major from Oakville, Mo., was a recent winner of the Truman Gold Medal Competition, and she will perform Gershwin’s “Rhapsody in Blue” with the Truman State University Symphony Orchestra next semester. Matt Safley, a music major from Peterson, Iowa, recently had two performances of the final movement of Mozart’s “Piano Concerto No. 21” with the Omaha Symphony as winner of the Robert Spire Piano Competition. Both Frick and Safley will be performing degree recitals next semester. Mariquit “Kit” Hadwiger, assistant professor of nursing, and Stephen Hadwiger, associate professor of nursing, presented “International Education Represented by Nursing Students During Study Abroad in the Philippines” at Pi Pi Research Day on Nov. 4 in Quincy, Ill.
Huping Ling, professor of Asian history, has been featured in radio talk shows at KWMU 90.7 (NPR in St. Louis), “St. Louis on the Air,” on July 5, with host Harriett Woods (former lieutenant governor of Missouri), “Charles Brennan Show” KMOX radio station, “Voice of St. Louis” on Feb. 4, and in news articles, “New Book Detail St. Louis Chinese Heritage,” by John M. McGuire, St. Louis Post-Dispatch, Feb. 2 and “Breaking Out,” by Sara Porter, West End Word, Feb. 4 for her new book “Chinese St. Louis: From Enclave to Cultural Community” (Temple U. Press, 2004). She has also been invited to give presentations on and book signings for the book by the following institutions, agencies, and organizations: Missouri Historical Society Holiday Fair, Midwest Chinese American Science and Technology Association, Center for International Studies at the University of Missouri-St. Louis, St. Louis County Public Library Headquarter and East Bank Books, Carpenter Branch of St. Louis City Public Library, Barnes & Noble Bookstore, the St. Louis Chinese Association, St. Louis Modern Chinese School, St. Louis Chinese Culture Association, St. Louis Chinese American News, and Chinese American Forum, the Chinese Institute for Overseas Chinese History Studies (Beijing, China), the Chinese Studies Association of Australia Ninth Biennial Conference and the International Society for the Study of Chinese Overseas, (Bendigo Australia), the Coalition for Asian and Pacific Americans, and the Association for Asian American Studies (L.A.). Maria Nagan, assistant professor of chemistry, received a Cottrell College Science Award for her research titled “Molecular Dynamics Studies of Human Immunodeficiency virus Rev-RRE” and was awarded a grant of $35,400 to conduct research with students. An original musical composition by Michael Van Bebber, graduate student in music composition and trumpet performance, has been selected for performance at the 2006 Society of Composers Inc. Region III Conference. “Rounds” for brass qunitet will be performed at the University of New Mexico during the conference (April 2-5). Van Bebber is a student of Warren Gooch, professor of music. An original musical composition by Gooch has been selected for performance at the 2006 Society of Composers Inc. Region VI Conference. “Rhapsody” for also saxophone and piano will be performed at Rice University (Texas) during the conference (Feb. 9-11). The Kirksville area schools are in need of volunteer readers for the Martin Luther King Jr. Read-In events Jan. 19 and Jan. 20. Volunteers may sign up at the SERVE Center until Dec. 9. Sign up will also be available in the Center for Student Involvement during finals week and the holiday break. Contact Amy Currier at 785.4222 for more information. The Assessment Colloquium will feature Marcie Kotteman presenting her research on the “History of Assessment at Truman” at 4:30 p.m., Dec. 6, in the SUB Spanish Room. Contact the Center for Teaching and Learning at 785.4391 for more information. There will be an informational meeting for students who are interested in the Rotary Foundation Ambassadorial Scholarship at 4:30 p.m., Dec. 6, in Violette Hall 1412. Students are able to study in a foreign country. Applications are due Feb. 24 for planned international study between July 1, 2007, and Feb. 24, 2006. For more information or to pick up an application, contact Marilyn Romine at 785.4268 or Matt Eichor at 785.4667. Information is also available at http://www.rotary.org. Sierra at Truman is sponsoring a panel of speakers from Missourians for Local Control at 7:30 p.m., Dec. 6, in the SUB Activities Room. The topic will be “Fact vs. Fiction: The Truth About Confined Animal Feeding Operations (CAFOs) and Local Control.” This presentation is free and open to the public. Contact Jim Turner at 785.4348 for more information. SAB is sponsoring Holiday Lights at 9:30 p.m., Dec. 6, outside Kirk Memorial. Hot chocolate, cappuccino and cookies will be provided for free. True Men, Minor Detail and Unique Ensemble will perform. Contact SAB at 785.4722 for more information. The Center for Teaching and Learning Weekly Lunch Series will continue from 12:30-1:30 p.m., Dec. 7, in the SUB Spanish Room. Cynthia Cooper will be presenting “How One Faculty Member Does It.” Call 785.4391 for more information. C.I.A.O. presents Christmas in Italy at 7 p.m., Dec. 7, at the University Club. Those in attendance will be able to enjoy free holiday desserts. Contact Eric Schneider at eas631@truman.edu for more information. The Truman Biology Seminar Series will continue from 12:30-1:20 p.m., Dec. 9, in Magruder Hall 2050. Biology honors students will be presenting. Refreshments will be served at 12:15 p.m.
Students, faculty and staff are invited to join IT Services at their regular series titled “Tech Break” on Friday afternoons. This week's session will be from 2:30-3:30 p.m., Dec. 9, in the SUB Governors Room. The topic will be "CleanAccess - Understanding Its Role in Campus Security." Go to http://its.truman.edu/techbreak for more information. There will be a Recital of Piano Students at 6:30 p.m., Dec. 9, in Ophelia Parrish Performance Hall. Nine students of Janice Saffir will be performing piano solos and one concerto. The undergraduate performers are: Katie Craven, John Feiner, Avril Frick, Julie Jackson, Paige Mundhenke, Stephanie Rice and Matt Safley. Graduate students Michelle Jones and Dan Kubus are also performing. The recital is free and open to the public. Recital credit is available for music majors. For additional information, contact Saffir at 785.4421. The Kirksville Annual Holiday Bird Count will begin at 6:30 a.m., Dec. 10, in Magruder Hall 2024. Participants, who do not need to be experienced bird watchers, will count all the birds encountered within 7.5 miles of downtown Kirksville. Results of this and comparable counts in other locations are used to assess changes in avian abundance and distribution. Doughnuts, fruit, hot chocolate and coffee will be served. For more information, contact Pete Goldman at 785.4632 or pgoldman@truman.edu. Truman’s Cantoria Choir will be having its 40th Annual Pancake Day fund-raiser from 8 a.m.-3 p.m. Dec. 10. Cantoria members are selling tickets for $4 each. Tickets will also be available at the door. Contact Renee Gordon at 785.7315 for more information. True Men will present their annual holiday concert to benefit Habitat for Humanity at 7:30 p.m., Dec. 10, in Baldwin Auditorium. Admission is free, but donations are welcome. Staff Council will be sponsoring a Red Cross blood drive from 10 a.m.-3 p.m., Dec. 14, in the SUB Activities Room. Contact Jennifer Thompson at 785.7252 for more information. The Military Science Division cordially invites faculty and staff to attend their Open House from 11 a.m.-2 p.m., Dec. 14, in Baldwin Hall 156. Please come and enjoy food, drinks and fellowship. For more information, contact Doug Reinsch or Carmen Barnes at 785.4451. Applications are now being accepted for The Next STEP’s 2006 Summer Undergraduate Research Experience. Applications can be found and completed online at http://step.truman.edu. Deadline for applications is Feb. 1. For more information or assistance, contact Jennifer Thompson at 785.7252 or step@truman.edu. Phi Kappa Phi is accepting applications for the 2006-2007 Graduate Fellowship Competition. Eligible students must be an active member of Phi Kappa Phi and have applied to enroll as a full-time student in a post-baccalaureate program of study. Selection will be based on the applicant’s promise of success in graduate or professional study as evidenced by academic achievement, study leadership and service, letters of recommendation, acceptance in an approved graduate program, and a statement of goals. Nationwide, 60 Graduate Fellowships in the amount of $5,000 and 40 Awards of Excellence work $2,000 will be awarded. Applications are due to the Truman chapter, care of Mike Ashcraft, Social Science Division, by Feb. 1. Application materials are available online at http://www.phikappaphi.org. Contact Wynne Wilbur at 785.4435 or wwilbur@truman.edu for more information. Phi Kappa Phi is accepting applications for the 2006-2007 Study Abroad Grant competition. All Truman students are eligible to apply and should have a minimum of 56 credit hours and no more than 90 credit hours with a minimum GPA of 3.5. Winners will receive $1,000 for study abroad between May 1, 2006, and June 30, 2007. Deadline for applications (submitted to the Society Headquarters) is Feb. 15. Application materials may be obtained online at http://www.phikappaphi.org. For more information, contact Wynne Wilbur at 785.4435 or wwilbur@truman.edu. The International Student Affairs Office is looking for local families to link up with the new international students arriving in January. This is not a homestay program, but a chance for students and the families alike to learn about different cultures. Students and families enjoy participating together in normal activities such as shopping, sharing meals, and watching movies. Contact the International Student Affairs Office at 785.4215 for more information.